Think You Don't Need a Will? Many people don't think about making a will until they are at middle age, or even older, for many reasons. For some it is a fear of death; others don't think about the consequences of their death on their family. But everyone who is at least eighteen years old should have a will, because making a will is the only legal way to ensure that your wishes are followed concerning what happens to you and what happens to your property after your death. Pictured is Beethoven's Last Will and Testament. You don't have to be as famous as Beethoven to need a will! I am not a lawyer. Each state and country has different laws concerning wills. This article is intended as general advice only. Please consult a lawyer for your particular situation. As part of preparing for the disposition of your property, you should check with your banks, and designate beneficiaries for each of your accounts. If you have no relatives, you may wish to leave your money to a charity. You should check your accounts every five years, to make sure that your situation has not changed (marriage, divorce, adoption, majority of minor children), and make any changes you desire. Don't forget your retirement accounts and safety deposit boxes! You should also write down all your digital accounts: email, facebook, twitter, etc., and login and password information. Put this in a safe place (the safest would be storage at your lawyer's office). A will is a legal vehicle for transferring property after your death. This can be as simple or as complex as you wish. You can leave all your possessions to one person, or you can designate each item you own and its heir (e.g., "My Santana Abraxas CD should go to my cousin, Janice."). Most of us will be content to designate heirs for things like furniture, cars, houses, and bank accounts. Some items that may not be wanted by family members might be designated for charity (for example, an old piano may be given to an after-school program), or to be sold and the assets distributed to your heirs. You will also need to name an executor for your will. This is the person who will ensure that your wishes are carried out, so you need to pick someone who is reliable, responsible, has the skill set necessary, and is likely to outlive you. There is no point in making someone who has never used email your digital executor. Therefore, you need to think closely about your bequests and make sure that your executor has what it takes to carry them out. You may have multiple executors: for example, authors have literary executors, and people who own real estate may want a separate executor for property transfer or sale. If your situation is complex, or you have significant assets, such as you might see on Antiques Roadshow , you may wish to get appraisals for property as well. There are things that don't belong in a will, and these should be in a separate document so that your heirs know what to do when the time comes. Funeral instructions should be in a document known as "Disposition of Remains." (One reason for this separate document is that your will might not be discovered or read right away, sometimes not until after the funeral!) Here you can specify any arrangements, note the location of your burial plot, or direct any kind of ceremony you wish. If you are religious, you may wish to consult with your religious leader so that you understand any kind of restrictions dictated by your religion. There may be a separate document appointing an agent to control the disposition of your remains. Care of an incompetent should be in a separate document known as a trust. If you have a spendthrift relative, or one who is not in possession of all her or his faculties, a trust will see that they are cared for after your death. In some states, a lawyer can draw up a trust in case of incompetence (accident, dementia, Alzheimers). If you have already named a beneficiary on an account or insurance policy, you cannot change this in a will. You must change this on your account or policy. What if You Don't Have a Will? Remember that in the days following your death, your family will be overwhelmed. Grief expresses itself in strange ways, and relatives may have a falling-out that could last for years or decades. This almost happened in my own family, and the fight started over items that my great-aunt didn't specify as bequests. As a result, some family members got left out in the cold, while other family members ended up with items they didn't want or need, and couldn't dispose of afterwards without setting off another fight. Don't let this happen to your family. If you have digital content, someone needs to take control of it and understand your wishes. This includes facebook, email, and any other digital accounts you may have. One family almost bankrupted the estate of a woman in court battles over whether her facebook account should be closed, because some relatives wanted it left open, and others wanted it deleted. Similarly, files on your computer, such as pictures or videos, or documents or artwork posted online, may need to be deleted or preserved. If you leave your computer and smartphone to someone, vital information such as family trees, family pictures or home movies, or family recipes could be deleted, never to be recovered. Save money and time by understanding wills, trusts, and estates before you talk to a lawyer. Since legal fees can run $400 per hour, you want to make sure that you understand what you want before you sit down with an attorney. 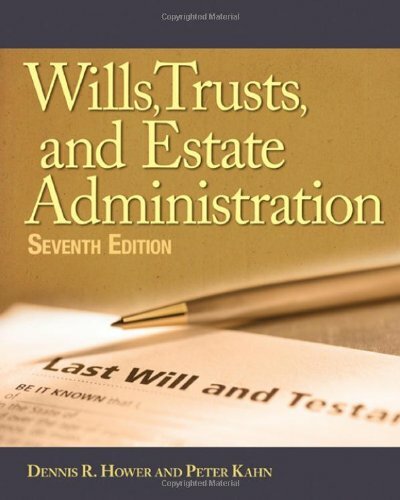 This book is intended for paralegals, but discusses every aspect of wills and trusts in a way that even non-lawyers can understand. If you have more than a car and a few sticks of furniture, you will want to read and understand this book before talking to a lawyer. While this book is something of an investment, you will easily save the price of the book because your lawyer won't have to do so much work, you can talk in terms you both understand, and your legal fees will be far less. Very important article for everyone of all ages, not just for oldies like me. We made a will several years ago and were just talking about redoing it the other day so this is a great reminder to make sure we do it. So many things have changed since we did our original one and by reading this it has reminded me of those changes. I have got rid of most of my earning articles so that is not a problem. Although I had not thought about the social media ones. Thanks for a very informative article which should help many other writers too.